Travel motion sickness.... call it air sick, sea sick, car sick... whatever. You don't think you should take that cruise or fly? Don't let fear of motion sickness keep you from any form of travel! I tell people I get sea sick in the bathtub! ...But travel motion sickness doesn't limit my travel adventure. There is hope for you too. Help is out there, and our tips are below. ...Looking for a good place to pull to the side of the road. You're sure you're turning green. You know you're at least pale, cold and hot at the same time, and sweaty. It's not a pretty picture, and it doesn't feel good! Travel motion sickness happens when the brain gets mixed signals from the other parts of the nervous system. Let's just say I've tried aerobatics, and I'm not good with that kind of flying. Travel motion sickness shouldn't keep you from a dream trip. But I'd go back again in a heart beat. Did I have some "green" moments...? Yea... and I'm not talking environmental consciousness here. 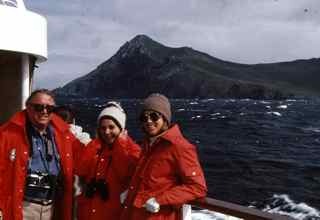 I did have some sea sickness at first, but on that long cruise, Scopolamine patches worked wonders. ...and I can take that boat ride to the dive site with no problem. 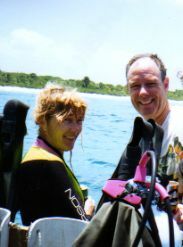 It's way more fun exploring Bloody Bay Wall in Little Cayman or some other great spot when you're NOT feeling queasy. 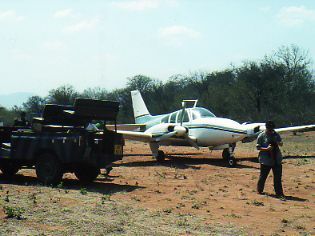 If we're going to be flying into a safari camp or other remote area on a small plane, I'll take something just in case. I'd rather arrive ready to see lions and leopards and elephants than just wanting to lie down and recover from a bout of air sickness. How Can You Prevent Sea Sickness? You just have to figure out what will work best for you depending on how long the trip is, and how sleepy a medication makes you. If you eat the right things you may keep travel motion sickness from getting started. This works somewhat for mild motion sickness. Try crackers, a plain bagel, or dry bread. I've read that carbohydrates can soothe an upset stomach by neutralizing gastric acids. Carbs go through the digestive tract quickly. Fatty foods take longer to digest. Faster is better... I can tell you this for sure.... you don't want a full stomach when you're feeling queasy! Ginger is touted as as aid to prevention. You can get candied ginger, ginger chewing gum, ginger pills or even try eating ginger snap cookies. This has helped me a little. You'll have to try it for yourself to see how it works for you. Wrist bands are drug-free... they work to prevent travel motion sickness by gently exerting pressure on an acupressure point on the inside of the wrist. In Eastern medicine, this is believed to help stop nausea. There are several brands on the market. Some use just pressure, some send electric jolts to the pressure point. There seems to be some medical evidence emerging that these might work. We offer this as a possibility, but we've never tried them. If you're like me, you know when you'll need more than crackers, ginger or a wrist band. These are all over-the-counter. You can get generics as well as these name brands. These are antihistamines. They sedate the nerves of the inner ear, making those little nerves -- and you -- less sensitive to upheaval, rocking, and rolling. They may cause sleepiness, so take care with them until you know how you'll react. This is especially important for driving and diving. I've done well with meclizine 25mg (the generic of Bonine). It's good for me on rough dive boats, winding roads, and bumpy small airplane rides. Scopolamine is available in both tablets and patches. Both of these require prescriptions from your doctor. The tablets work for up to 8 hours. With the tablets you can regulate your dose... One to two tablets depending on how much you need. The patches are best tried for a cruise where seasickness is a concern for a number of days... because the patches work for up to 3 days. You stick the prescription only patch behind your ear and the medicine seeps into your bloodstream, depressing the central nervous system. In my experience, it's pretty effective. We have friends who have used the scopolamine patches for dive trips.... for several days of diving in a row or especially for live-aboard dive boats. If you're diving with the patches, as with antihistamines, be sure you know how you'll react before the dive so your judgment isn't impaired at depth. Be sure your patch is stuck on clean dry skin with no hair trapped under it, so it won't float off when you're under water. You can read much more at the CDC site on motion sickness. However you choose to fight it... don't let travel motion sickness keep you home. There's just too much of the world to explore.